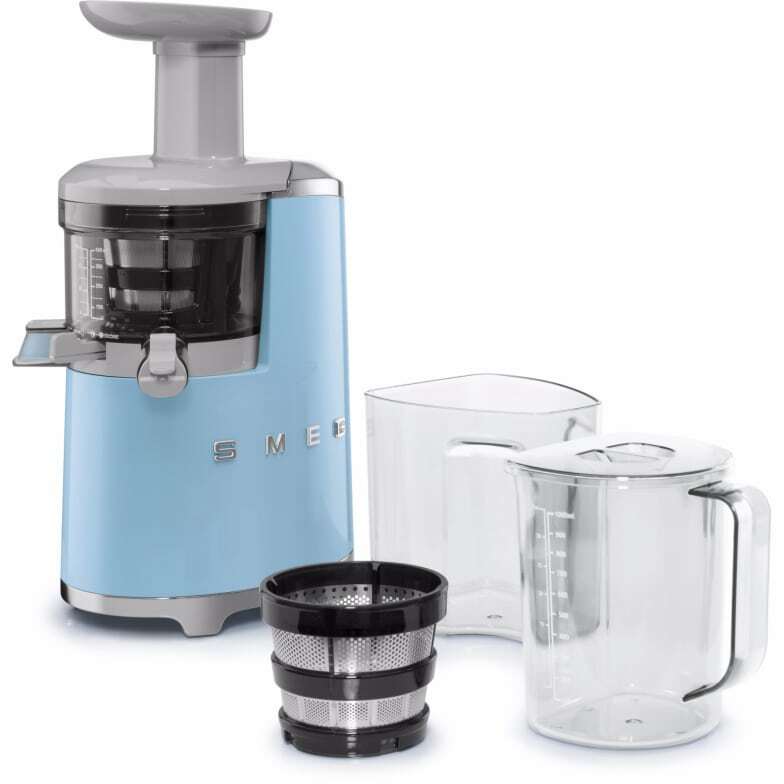 More and more consumers are looking at ways to improve their lifestyle and eat fresh and healthily, and we can take full advantage of this, enriching our diet with the help of the new Slow Juicer, the newest addition to the 50’s Retro Style Small Appliances family. Smeg’s all-new SJF01 Slow Juicer produces fruit and vegetable juices of the highest quality in terms of nutritional benefits: the unique cold-extraction SST ™ Slow Squeezing Technology (43 rpm) means that it is now easier than ever to consume the nutrients you need as part of a healthy, balanced diet. The “worm-screw” auger made from Ultem ™, a cutting-edge material offering superb durability, reproduces the classic manual squeezing action, gently pressing the ingredients against the walls of the strainer, which is equipped with holes of two different diameters. Using the lever provided, you can adjust the density of your juice, letting more or less pulp through. This pulp is rich in proteins, carbohydrates and fats, and just the right amount of dietary fibre. Drinking a juice 10 minutes before breakfast, lunch or dinner is 4 times more effective in terms of delivering benefits than consuming the same foods normally. Do you have a question about "Slow Juicer"? How can we contact you?